What is particularly chilling about Harry Lime is that he still cares (somewhat) about (certain) people, he feels pity, and believes in God, yet makes a very profitable living from swindling children’s hospitals. Innocents die, and Harry knows. This is a very human evil, an evil that can be rationalised and made to fit- or improve- one’s lifestyle. Harry isn’t even exceptionally fearless or desperate, and he certainly isn’t certifiably insane. What Graham Greene does best, in my opinion, is to avoid black and white thinking when it comes to people, all the while never forgetting that there clearly is both good and evil, right and wrong. Evil is scary not because it is is distant and alien, but because it occupies the same sphere as we do. It could be present in our best friends, in our lovers, or scariest thought of all- it could even be part of ourselves. What Lime engages in is a kind of objectification or dehumanization of others. Flesh-and-blood human beings become mere abstractions, caricatures, or “dots.” I thought of this film as I was reading through the Arbinger Institute’s The Anatomy of Peace. It is a modern fable that is used to relay concepts for conflict resolution.2 It explores the various ways in which we delegitimize and eventually dehumanize those we don’t know, those we work with, and those even within our own families (what the book calls being “in the box”). Most of us recognize what the story describes as the “better-than box” as the most common form–if not the only form–of dehumanization: I am superior or better than another. I am more important or perhaps more virtuous. By implication, they are inferior, irrelevant, and wrong. The other methods of dehumanization, however, are a bit more subtle and easily overlooked. The “I-deserve box” views oneself as victimized, entitled, and unappreciated, and therefore sees everyone else as mistreating, ungrateful, and unfair. The “must-be-seen-as box” requires one to be thought of well, to play a role. This turns everyone else into an audience; a threatening, dangerous, and judgmental one at that. Finally, the “worse-than box” beats oneself down as broken and deficient. This automatically makes others privileged and advantaged. These worldviews lead to feelings of indifference, disdain, anxiety, or bitterness. To move out of “the box” toward people is not so much a way of acting (though this is obviously important) as it is a way of being. Genuine connection with others requires that we recognize their inherent worth and dignity as people and as individuals. 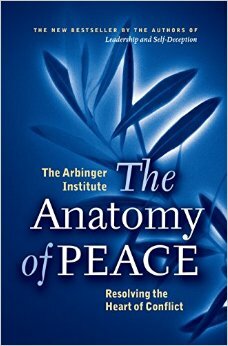 This is the anatomy of peace. This is what love starts to look like. Kindness, consideration, courtesy, care, laughter, unselfishness, prayer, thoughtfulness, doing things for each other, forgiving each other, sustaining each other, loving each other—these are notes that form a family symphony happily enjoyed and eternally remembered. If a family loses its cherished human values and deteriorates into only the form of a family, it has lost what a family is for. Whatever changes are said to have occurred in our time, there is left to the family the most important purpose of all—the satisfaction of the basic emotional and spiritual needs of its members. In any era, one has written, society is a “web of which the family forms the central strands.” In home, family, and love lie the resources that fulfill the life of the individual and the life of the community; indeed, the resources that would redeem our troubled world and bring it lasting peace. Children must be safeguarded and reared. Only in the home can children be assured of the love and direction they need to live life, and only parents who genuinely love can meet those needs. But it must be more than a preached or pronounced love; it must be love that takes time, makes the effort, listens patiently, gives freely, forgives generously, “provides the amenities that will grace and adorn and make beautiful the relationships of family life” (bold mine). To move out of “the box” is to recognize the basic emotional and spiritual needs of others and then seek to meet them. And it is within the family that we first learn this fundamental attribute of divinity. This is one of those books that I buy copies of to give other people. I love how you connected it with this week’s reading. Thanks. It is currently #57 on the American Film Institute’s list of 100 Greatest American Movies of All Time. Their book Leadership and Self-Deception is similar in nature. Craig A. Evans, Matthew: New Cambridge Bible Commentary (New York: Cambridge University Press, 2012), 136. This cosmic conquering of Satan is the Christus Victor model of Atonement. I don’t have much to say about the first two talks. Boyd K. Packer’s was unremarkable and pretty much reinforced the “I knowism” in Church culture as well as the “too sacred” line about spiritual experiences and the temple. Alvin R. Dyer’s talk was more-or-less a list of scripture passages that reference the second coming. The main point was kind of lost on me. Either that or the point wasn’t all that important.